SWAG vs the Cool Clothes….. I was preparing for a bike session last night in my dining room gym and was looking thru my closet for something to wear. Now I know my hubby is laughing over this because my closet is full and I want to move him out of the second master closet and put his clothes in the spare room would like more space. I am pretty set up at this point and don’t really “need” much so am able to pick and choose the new “cool” clothes that I want to buy. Since I don’t have a “need” for workout attire I can occasionally grab a few things off internet sales which I normally wouldn’t buy due to their original price tag but once they hit the sale rack it’s fair game! 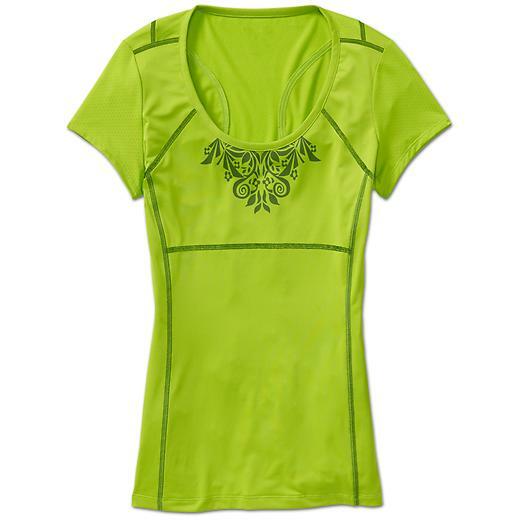 Like I’m waiting for this new piece from Athleta to hit the sale rack….and since it’s new, it will be a long wait. This limeish, bright green is my absolute favorite color and I love the fit of their Accelerate Tee. So last night as I was browsing my closet, I was noticing the race shirts that I have kept vs. my “cool” clothes. I normally wear race shirts for lounging, sleeping and my dining room gym workouts. It is highly unlikely you will see me on the trail with a race shirt. Why? Usually race shirts don’t fit me well. Most of the time I won’t even keep them. I may let them lounge in my closet for a couple of months or even a year but then they get donated. Or Aby takes them for bedtime attire. Or if you have run with me for a long time, I have probably showed up for a run with a bag of cast-a-ways that I offer up to whoever wants them. I do keep a very select few pieces of SWAG (stuff we all get) and if it’s hanging in my closet AND it gets wear time then that makes it a really great piece of SWAG. The race shirts in my closet include those I receive from the Shamrock Shuffle, not because it’s my favorite race of the year but because they give Nike Tech shirts that are gender specific. 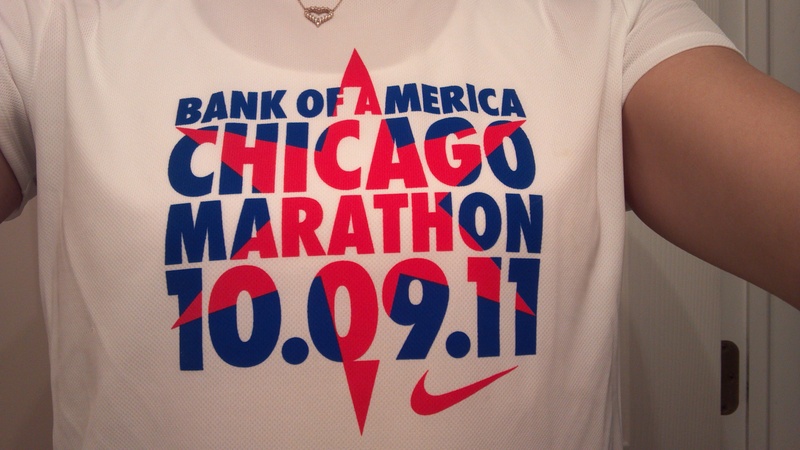 I also keep the Chicago Marathon shirts for the same reason. I just pulled the tags of my 2011 Chicago Marathon shirt last night. I love this shirt. I haven’t worn it before now because I didn’t want it to get toddler funk on it for various reasons but it’s a cool shirt in the way it looks and it also has a good fit. In fact, I love this shirt so much that I bought a skirt to match it from RunningSkirts.com. So there is a possibility you might see this one on the trail. I have also kept one Southwest Bank 1/2 Marathon shirt that was a women’s specific Mizuno shirt. I keep a handful of long sleeve tech shirts. 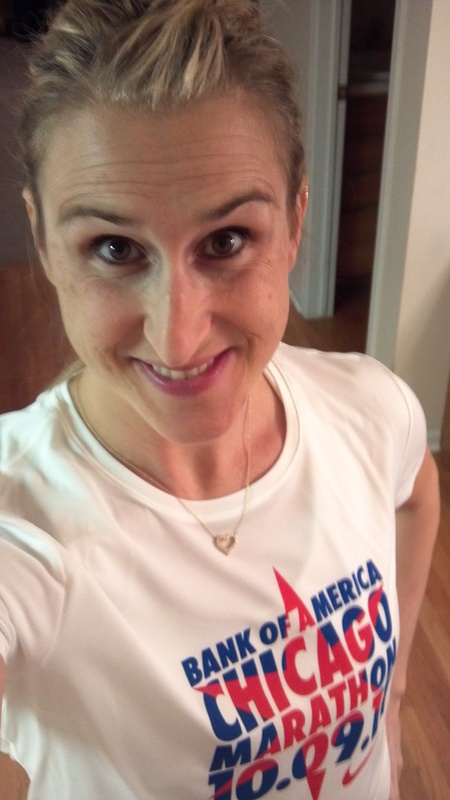 I love the new A-4 brand women’s shirts that I have just started to see come thru some low-budget races. These A-4 shirts feel like butter and just are prefect for running when I am lucky enough to get a gender specific shirt. I also have kept my Hot Chocolate windbreaker and have used it multiple times. Other than those items, not much stays in the closet and if it does, then I normally wear it around the house or for cross training workouts. I just feel awkward wearing race shirts, like it bragging. And I like to encourage newbies to be out there on the trail WITH me, not behind me. No need to kill their confidence by showing up in a 70.3 or marathon shirt. If they want to talk about my races, great, I’m happy to oblige but I don’t want to intimidate them into not coming back because they think I’m more experienced or stronger or bragging about what has been. So know that if you see me in a race shirt that I REALLY love that shirt or it would have never hit the trail with me. How do you feel about race SWAG? Do you wear it proudly, donate it, keep it but push it to the back of the closet or just use it for pajamas? This entry was posted in "Run"Way Fashion, Cross Training, Randoms, Running and tagged Accelerate Tee, Athleta, Chicago Marathon, Nike, RunningSkirts.com, SWAG by tootallfritz. Bookmark the permalink. You deserve to be proud, April! Wear it! I’m so excited for you! Need more stuff? LOL! I just purged and gave a bunch of stuff to a new runner a couple months ago but have a few things that are just taking up space….one 1/4 zip light weight mesh jacket/shirt thing that I just can’t seem to part with even though I have never worn it. Let me know, I can hook you up! All I have is what you’ve seen me in… ONE outfit! LOL!! Total “NEWBIE”!! If it’s cotton, it’s for lounging only. The tech shirts rarely fit me, and they end up getting used for indoor (in my basement, where people don’t see me) workouts. The gender-specific tech shirts are lovely and I’ll wear them. Yeah, when I see cotton, I cringe. No chance of a cotton shirt getting any wear. I keep the tech shirts and run/work out in them (hey I “paid” for them, I’m gonna use them!) Sometimes they spark conversation – someone will ask about the race and if it’s worth doing. But I’ve donated all of my cotton shirts. I don’t work out in cotton, and I have enough cute stuff to lounge in that I’ve accumulated over the years and through clothing swaps with my friends. Also, my husband NEVER wears his race shirts (sometimes they don’t have his size, but I think also he just doesn’t like them), so now when I register him for a race, I pick my size for his shirt. I’m paying for it anyway, may as well pick a size that will get worn! Especially for races that have something nice than a t-shirt, like a jacket or pullover. I like to wear my race swag proudly… During my marathon training, I felt strongest during my 20 miler so I have much more pride wearing my “Ready to Run 20 Miler” shirt than my GR Marathon or Chicago Marathon (x2) shirts. I dislike when races give out white running shirts. Between my stinky sweat, hard water, and accident-prone personality, I wear these shirts sparingly to try and not ruin them… However, I think I wear race shirts more for training than when running other races. This comment ended up being longer than intended, but I def think it will be interesting to hear everyone’s perspective on this topic! I have hard water too, so my whites end up very muddy……which is another reason that I haven’t worn this marathon shirt yet. But I LOVE white, goes with everything. I dislike the dark colors a lot. Bright good, Dark bad. LOL! Haha, totally agree! I mean, who wants to run in a black t-shirt or tank top. If it is hot enough to wear a tank top, why on earth would you want it to be black?? IF I had earned a marathon shirt, I would wear it everywhere, every day! It’s so funny what kinds of things motivate people. I did a half marathon just to earn the skull belt buckle that I ABSOLUTELY HAD to have, although I knew that I would never use it! I do wear my run t-shirts to the gym or when training, although the cotton ones pretty much get donated or worn to bed. Gender specific are worth the extra race price. Maggie posted a blog from someone who disagreed with race medals, and it really made me mad (not at Maggie, but at the blogger!). Sometimes we have to do whatever it takes to stay motivated, whether it’s a bumper sticker, magnet, Viking hat, t-shirt, or medal. And some days my race t-shirt just makes me feel proud! I think seeing someone wearing a shirt that I want to earn motivates me to do better. I don’t look at them as if they are bragging. For example, I want Maggie’s blue Zoo Run shirt, and I sure do want that Chicago marathon shirt that you are wearing, so maybe this is the year for me to EARN them! TTF….I love your perspective on life and run…and this one on Swag nicely expressed. I don’t necessarily agree with you showing up to some F’N run in some shirt that states ya did something phenomenal…just as long as you don’t leave your flock unattended and way behind. In fact….wear ya shirt that states you did something phenomenal….and then just lay-back and run with your flock…run with them as they your brother or sister….just hang with them and give them the company and support they may need. Remember…ya run your race…every individual has their own race to run and every runner worth their salt or that understands running will be there to support you with encouragement or outright assistance (if need be) because that’s what running is all about….not about speed or being first, second, third or winning trophies or such….just doing it and feeling good when you finish. The Swag is there and if you earn it running some race….then wear it to let others know ya where there. But…giving away your shirts and swag is noble cause if you run long enough ya end up with way oh-so much garb one cannot possibly make use of. So…just put it to others good use! I like the comment by “Susan” something to the effect that if she ever ran a marathon she would wear it with gusto…well….there is nothing wrong with giving Susan some Marathon shirt and letting her run in it if if motivates her to train and complete her first marathon. See the possibilities here? To borrow from the big Corporations….Run Inspired! And inspired is whatever inspires you and that includes Swag and such. Just run inspired!